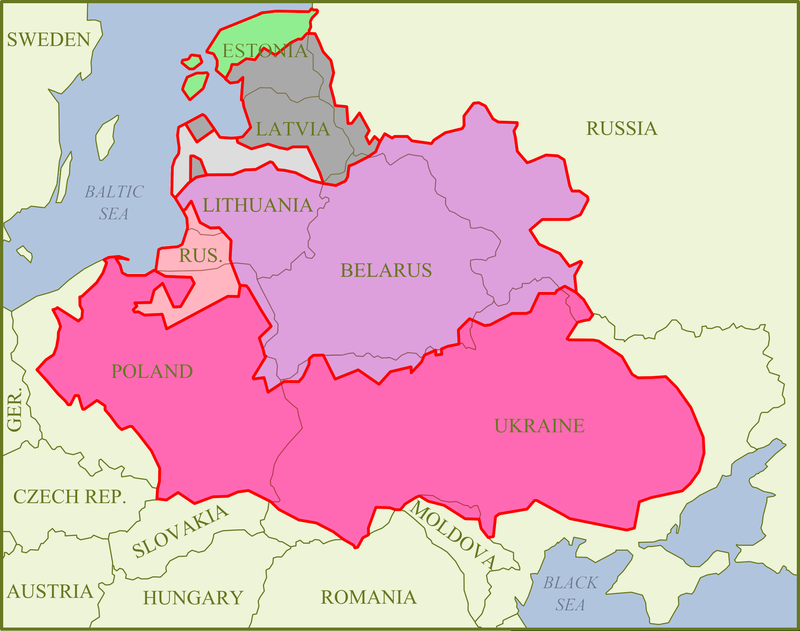 The Polish-Lithuanian Commonwealth (magenta) on a map of Europe, 1648. Since the 17th century, in international relations, it was usually known as the Most Serene Republic of Poland, Serenissima Res Publica Poloniae. Locally it was called Rzeczpospolita – a calque translation of the Latin expression res publica (literally: public affair). Foreigners often applied the name Poland to the entire country. Today, English-speaking historians favour the name Commonwealth which is another translation of the Latin res publica. 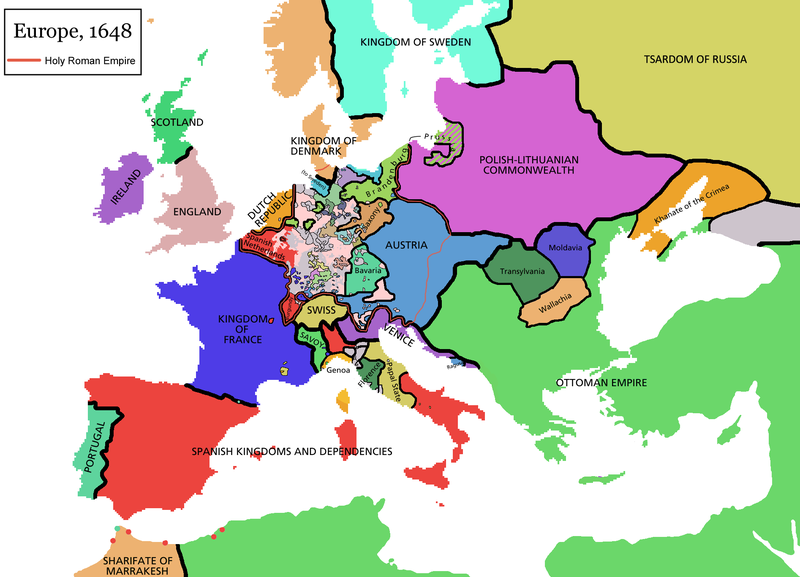 The Commonwealth consisted in two main parts: Korona (the Crown), used in reference to the territory of the Kingdom of Poland, and Lithuania, applied to the territory of the Grand Duchy. Its borders changed over the centuries. At its greatest it stretched over the territory of a number of present-day countries: Poland, Lithuania, Ukraine, Belarus, Latvia, southern Estonia and parts of Russia, Moldova, Romania and Slovakia. Poland and Lithuania entered into personal union at the end of the 14th century. In 1569 their ties were strengthened by the Union of Lublin that gave start to the Polish-Lithuanian Commonwealth. In 1795 the country was erased from the map of Europe by its neighbours: Russia, Prussia and Austria. Poland and Lithuania would not be re-established as independent countries until 1918. The Commonwealth was at a time the largest country in Europe (the territories of both the Ottoman Empire and Russia having stretched over other continents). However, historians rarely call it “empire”, because the country didn’t fight wars if it could be avoided. It had no imperialistic ambitions and didn’t want to influence the politics of other countries. The Polish-Lithuanian Commonwealth was the longest lasting union in Europe, binding the fate of its peoples for some 400-500 years. The Commonwealth consisted in two parts. Korona (the Crown) in reference to the territory of the Kingdom of Poland, and Lithuania in reference to the teritory of the Grand Duchy. Very interesting post. I could have used you as a tour guide this summer in Poland. I spent 3 weeks in the central and northern part of Poland. I was struck how much impact the Teutonic Knights had on Polish history in the middle centuries. I was not aware of the relationship between Poland and Lithuania. I also got out to Grünewald a few days before the big party and then also toured Malbork Castle too. Look forward to reading some most posts as you have time. Thanks! I hope you enjoyed your trip to Poland. I intend to write about the battle of Grünewald. It’s 600th anniversary after all. Yes, it was a big deal to us, both the Teutonic presence and the fact that we got rid of them by uniting with Lithuania. Yes, very interesting post indeed. I’ve spent the last few years trying to get to know and understand Polish history – it’s history is certainly one which is full. Learning about Poland has also spurred me on to learn about it’s neighbours namely, Ukraine and Lithuania. Ukraine is a wonderful country also and I hope to visit Lithuania asap to see the delights there. Thanks! I’m also interested in Lithuania, Ukraine and Belarus. I’ve been to Kaunas and Vilnius. I hope to visit Lviv and Minsk.